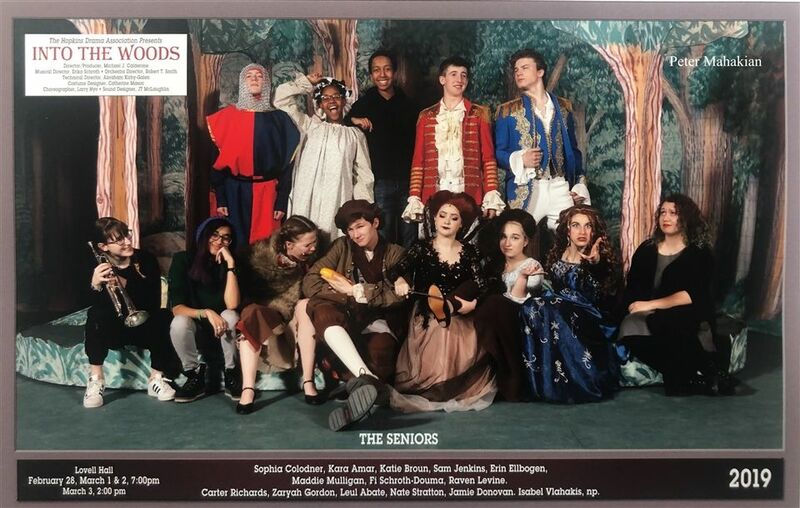 Into the Woods was the final Hopkins musical for fourteen seniors, thirteen of whom are pictured here. The musical, written by James Lapine with music composed by Stephen Sondheim, intertwines the plots of classic fairy tales like “Cinderella” (Erin Elbogen ’19), “Little Red Riding Hood” (Katie Broun ’19), “Jack and the Beanstalk” (Ty Eveland ’22), and “Rapunzel” (Isabel Vlahakis ’19). Each character has a wish they hope to be granted by the Witch (Fi Schroth-Douma ’19), but must deal with the unforeseen consequences of her powers. For the first time in his career, Calderone rented a backdrop for the musical’s set. He described his hopes for bringing the set to life, “The idea [that] developed between me and Cathy Mason, our costumer, was that the characters literally and figuratively get pulled out of their storybooks. She represents that with costume pieces made out of actual books (look at costume details like Cinderella’s bodice, the princes’ shoulder decorations or blouses printed with text.) I hope the set transported the audience to a bookshelf in a child’s room. There are stacks of giant books on either side of the stage and three open books as the backdrop of the three main story lines. But these characters are forced out of their books and literally into the forest.